A switch hitter has the power to change any game he is in. His ability to hit from either the right or left side helps set up favorable pitching match-ups for his team and also makes the opposing teams pitching coach work twice as hard to scout his team. But it is the switch-hitting slugger that causes the most fear for a pitcher… especially when the player coming to plate was one of the most prodigious home run hitters in history, such as 500 Home Run Club members Mickey Mantle and Eddie Murray. Both men amassed enormous quantities of home runs from both sides of the plate, and were threats to send one flying into the seats at anytime from either side of the plate. Even more remarkable, both of these baseball legends achieved the remarkable feat of hitting at least one round-tripper from each side of the plate in the same game (something less than one hundred MLB players have ever done). 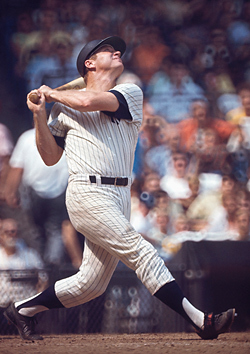 "My dad taught me to switch-hit,” Mantle explained. “He and my grandfather, who was left-handed, pitched to me everyday after school in the back yard. I batted lefty against my dad and righty against my granddad. My dad foresaw the platooning that managers like Casey Stengel would use years before it happened. He told me I had to be a switch-hitter if I was going to play." When a sportswriter suggested that Mickey become a full-time right-handed hitter after injuries hampered him from the left side, Mantle replied. “Not after all the time my dad spent teaching me to switch-hit." “Amazing O” Eddie Murray set the all-time marking by smoking long-balls from both sides of the dish 11 times in games played both in the American and the National league (9 AL and 2 NL). Editor’s Note: Two players in MLB history have hit home runs from both sides of the play during the same inning: Carlos Baerga of the Cleveland Indians on April 8, 1993 (off Steve Howe & Steve Farr) and Mark Bellhorn of the Chicago Cubs on August 29, 2002 (off Andrew Lorraine & Jose Cabrera).